Tuberville was hired to coach the Bearcats in December 2012, but did not coach his team in last year's Belk Bowl. 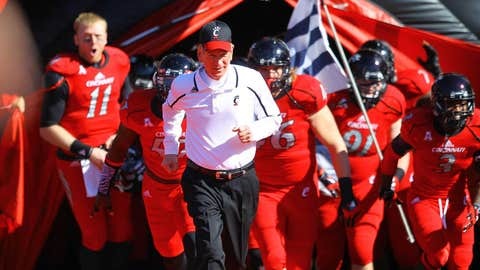 CHARLOTTE, N.C. (AP) — Tommy Tuberville and Cincinnati are back in the Belk Bowl — and this time he’ll actually get to coach the Bearcats. 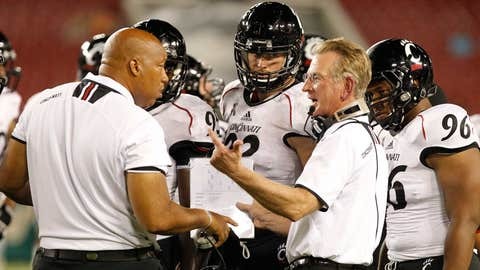 Tuberville was hired on Dec. 8, 2012, by the Bearcats, but didn’t coach in last year’s Belk Bowl. Instead, Steve Stripling served as the interim coach after Butch Jones resigned weeks before to take a job at Tennessee. However, Tuberville was on hand for the practices leading up to the game and said that experience gave him a jump start on this season. "I’m not as stressed as I was this time last year," Tuberville said Friday with a laugh. "But it was good to come in last year and get to know a lot of these players, watch practice and watch the game and figure out, hey, we might need to do this or that in recruiting. So I got a head start." On Saturday, the Bearcats (9-3) will try to become the first team to win back-to-back Belk Bowl titles when they face North Carolina. The Tar Heels (6-6) became bowl eligible despite starting the season 1-5 in their second year under coach Larry Fedora. Tuberville said he never thought the Bearcats would win nine games, especially in a year in which offensive lineman Ben Flick died in a car accident in September and 16 other players sustained season-ending injuries. "These kids persevered," Tuberville said. "I’m proud of them. It’s been a hard year on them." Fedora, in his second season as coach, is looking for his first bowl win with the Tar Heels. His team overcame some adversity as well, battling back from a 1-5 start to become bowl eligible. "I don’t want anybody to think we’re just happy to be here," Fedora said. "We’re not. We want to win a football game. We want to end this season the right way. Getting back to being bowl eligible was a big accomplishment. Now let’s go out there and finish the job." STOPPING EBRON: Tar Heels tight end Eric Ebron is being billed as a likely first-round pick in next year’s NFL draft. It’s easy to see why. The 6-foot-4, 245-pound junior is the team’s leading receiver in what he said will be his final game with the Tar Heels before turning pro. He caught 55 passes this season for 895 yards and three touchdowns. "He’s the prototype tight end that a lot of NFL teams will be looking for," Fedora said. "He’s a big guy who can run like a wideout and catches balls like a wideout. He can be a huge factor at the next level." Said Ebron: "This is my last game as a Tar Heel and I just want to go out and do what I’ve been doing all season." KAY LOOKS TO REPEAT: Brendon Kay gets a chance to pull off a rare feat and become the first player in Belk Bowl history to earn MVP honors in back-to-back seasons. Kay threw for 332 yards and four touchdowns and ran for 76 yards to lead the Bearcats to a victory last season over Duke. "It was a lot of fun last year," Kay said. "For me, as far as the MVP thing, as long as we win the game then great. If it takes me getting that trophy then great. I don’t care who gets it. I just want the W."
MARTIN’S RUSH: Senior defensive end Kareem Martin is the latest in a long line of top-notch North Carolina pass rushers. Martin, who has 11 sacks on the season, said the key will be pressuring Kay. "We have to make him uncomfortable," Martin said. "I’ve watched a few games and if we can get him off the spot we can make him force throws. If we can get him forcing throws into tight coverages our defensive backs will be able to pick it off." WILLIAMS’ RETURN: Tar Heels quarterback Marquis Williams returns to Charlotte, where he excelled as a high school athlete. He is the focal point of North Carolina’s offense throwing for 14 touchdown passes, while also leading the team in rushing in 490 yards and six touchdowns. BOUNCING BACK: Both teams have endured a long layoff since falling to their rivals in the final regular-season game. North Carolina lost to Duke, while Cincinnati was beat by Louisville. "I think both teams will have to pick themselves up," Tuberville said. "It’s tough losing to your rivals. It takes something out of you. I think that’s the key, which team is able to get the mojo back. And the one that finds it the quickest is going to have the advantage."